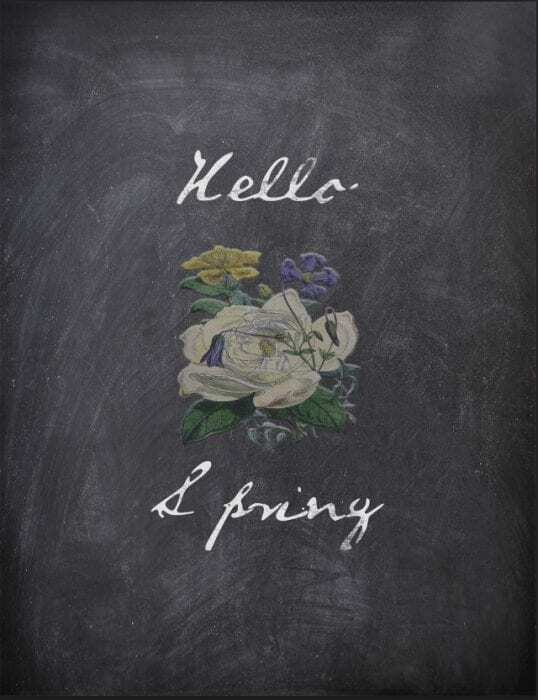 You are here: Home / DIY Projects / Crafts + Decorating / Free Printable: Hello Spring! Here is what our date night looked like last night. My husband taught me how to use Photoshop. And YOU, get a new printable. Spring Printable – download + print Flower image is from The Graphics Fairy – you can download your own, too! Since the death of my last computer (ok, ahem….we spilled wine on my last one as we were watching a tutorial on how to replace our garbage disposal) I was working on a number of printables, which ended up being lost in the mishap. Luckily, we purchased the Best Buy hardware warranty — and can you believe it? The hardware warranty specifically covers spills! (keyword: HARDWARE warranty, which costs extra). It took me three days of sulking to remember that I actually purchased that warranty. Also lucky? I had a grand total of seven days left under warranty at the time of the “accident”. So, my hardware credit for the old machine enabled me to upgrade to a new machine with a LOT more power. Needless to say, Best Buy is my hero. Hopefully this little printable gives you a little spring in your step. We certainly need to look forward to spring – we are still knee-deep in winter here…underneath that pile of snow on the deck is our fire pit. But you’d never know it. This is so cute! Pinning now! Hi there! Visiting from Munching Mondays. Very pretty printable! Thanks so much!